Make It By Jo Hill sewing kits give you everything you need to make lovely, decorative items for you and your home. Use the unique template that I have designed and create your very own wildlife textiles! 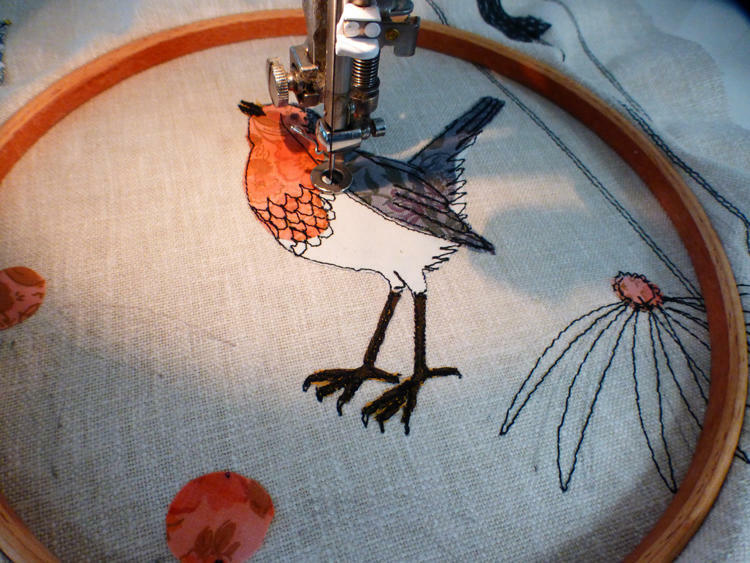 The kits are designed to be completed using a sewing machine to 'draw' onto the fabric using the free motion embroidery technique. The boxes contain all of the components required to make your finished item, and some include luxury hand-dyed fabric pieces too. I wanted to create a brand new range of kits to share my creativity and passion for sewing with you. Click on the images or scroll to the bottom of the page to find out more. The kits are suited to a range of abilities. The introductory kits are for those who'd like to learn free-motion embroidery, and there is also a more advanced range designed for the sewist who would like to improve and refine their free-motion sewing skills. If you're new to free motion embroidery, or you're intrigued by this exciting and addictive technique, you'll now be able to give it a go and learn how to do it from scratch. I think these kits are the perfect introduction to this rewarding art. Sign up to the Kits mailing list to find out more! I have several years of experience in teaching a wide range of sewing and home furnishing techniques to all abilities, and now run a varied programme of workshops from my garden studio alongside my creative practice. Each kit can be completed either by hand or with the sewing machine, with a special emphasis on learning and improving your skills in free-motion embroidery. Whether you are new to the exciting art of free-motion embroidery, or have already had a go at this technique, these kits are the perfect way to improve your skills. And you'll make something lovely at the same time! The robin lampshade and cushion kits are available now and are aimed at the intermediate sewist. I'm delighted to be able to share my sewing tips and techniques with you! I have been working in the textile industry for thirty years and sewing for even longer. All of my pieces are created using free-motion embroidery so you'll benefit from my expert guidance when you create your own. If you get an error message, please click here to fill in the form. Once you've signed up you will need to verify your email address so please look out for another email from me! Occasionally, these emails can end up in your junk/spam folder, so please check there if you don't receive anything. Never miss a Jo Hill newsletter! Please make sure you add me to your contacts list. Here is a handy guide on how to do this. Here are the first kits which are available to buy now!